If you’ve been looking for the specialized reloading tools from K&M, contact Precision Reloading, 1-800-223-0900, a catalog and online vendor located in Mitchell, South Dakota. Precision Reloading recently started stocking the excellent K&M Arbor Press, which can measure bullet seating pressure with an optional Force Gauge. 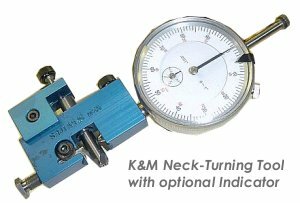 K&M’s neck-turning tool (item KMMACN) is a favorite of serious reloaders, and the Primer Seating Tool with depth gauge (item KMPST975, below) is perhaps the most sophisticated device of its kind. This gives a positive read-out confirming that your primers are all seated to the same depth. Bruno Shooters’ Supply also carries K&M products at very attractive prices. 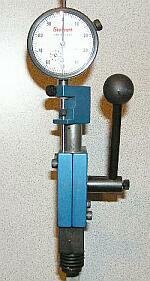 Shown below is the Neck-turning Tool with optional Pilot Jack, Carbide “doughnut-cutter” mandrel and indicator for neck-wall thickness. Share the post "K&M Tools at PrecisionReloading.com"